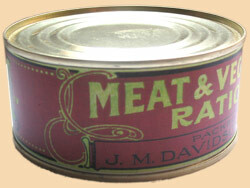 WW1 Reenactments Equipment : Great War Tommy WW1 Food Rations Labels : Scottish Meat & Vegetable Ration label, c 1916. WW1 Reproductions and WW1 Reenactors Equipment / Kit - Scottish Meat & Vegetable Ration label, c 1916. Scottish Meat & Vegetable Ration label, c 1916. One of a number of "Army" Meat & Vegetable Rations ( Army Stew) produced by commercial "Government Contractors" to the War Office during the Boer War and Great War. This one being Scottish. To suit cans 4" x 1.5".